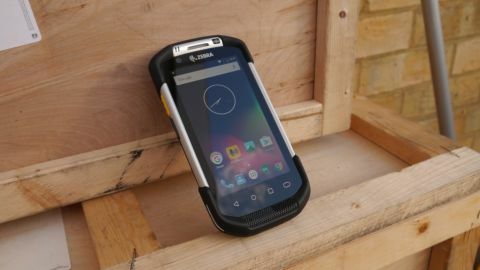 The Zebra TC75x brings mid-range smartphone performance to ruggedised devices, albeit with a hefty price tag. The handset does more than make up for its cost, though, thanks to an impressive build quality and an enterprise-level application suite plus support. Rugged smartphones will never reach the same sort of status as their consumer-focused alter egos (except perhaps for the Predator-like Cat S60). Their lack of finesse and edginess combined with the absence of cutting-edge components, and the fact that they represent relatively poor value-for-money, means that these devices will never sell in huge numbers. The Zebra TC75x is one of the newest rugged models to hit the market and carries a suggested retail price of more than £2,000 (around $2,580, AU$3,420); although you can get one with a steep discount (more than 30%) if you shop around. We sourced one (part number TC75FK-22B22AD-A6) from Stuff-UK for just over £1,400 (around $1,800, AU$2,400), which is about 20 times more than what you’d pay for a consumer-grade phone with similar components. But this is no ordinary smartphone (Zebra calls it a ‘touch computer’, hence the TC part of the name) and its target audience is not your average man or woman in the street; far from it. Aimed at the outdoor field workforce, the TC75x is built on a tried-and-trusted platform – on decades of enterprise mobility experience – and it’s at the centre of an entire ecosystem. You may have seen one of its predecessors (the TC70 or the TC55) carried by couriers all over the country, or if you’ve done a click-and-collect order at supermarkets or collection points. This device is built like a tank with rubber and (what looks like ABS) plastic moulded around a supporting metal frame. The TC75x is shaped in such a way that the handset can be held comfortably without having to tightly grip it (unlike ultra-thin smartphones for example), regardless of whether or not you wear gloves. At 384g, it is heavy, and with a 30mm girth, it’s also thicker than most laptops we’ve come across. But the engineers at Zebra have deliberately embraced this built-as-a-tank philosophy to reduce return rates and improve reliability on the go. The TC75x has both IP65 and IP67 certification which means that it is impervious to dust and can be dropped in water without harm. It will survive drops of up to 2.4m on hard concrete and has been tested to resist 2,000 1m tumbles (as per MIL-STD-810G). Additionally, the screen is covered with Corning’s Gorilla Glass and the scanner exit window is designed in such a way as to mitigate any damage due to shock. The phone has also been tested on a variety of other metrics including vibration (4G on three axes), thermal shock (from -40 to 70 degrees) and electrostatic discharge (up to +/-15kVdc air discharge). This is definitely not a bog standard smartphone – there’ no microUSB port or an audio port for headphones for a start. Everything here has been carefully designed and engineered to reduce damage and optimise workflow. That means using a small 4.7-inch HD display instead of a larger one with a higher resolution. Bigger screens tend to be more fragile and a higher resolution would mean higher power consumption. Many other ruggedised smartphones we’ve tested have adopted the same balanced combo. The power button is located next to the speaker grill, just above the front-facing camera and the prominent Zebra logo – this makes switching on your device even more convenient. On the opposite side are four touch-sensitive buttons – rather than the usual three – offering a bit more flexibility. A volume rocker can be found on the right-hand side while push-to-talk and scanner buttons are located on the opposite side. The scanner unit is situated at the top of the TC75x with a pair of pogo connectors at the bottom. The rear plays host to a 13-megapixel camera with flash and more pogo connectors (10-pin model) as well as one for a holding strap. A 4,620mAh battery – with a battery swap function – powers the handset and underneath it, located behind a watertight flap, are four slots: two can accommodate nano-SIMs, one can take a mini-SIM and the fourth one a microSD card. A Qualcomm Snapdragon 650 powers the TC75x, a 6-core SoC clocked at up to 1.8GHz. Our model came with 2GB of RAM and 16GB on-board storage with a 4GB/32GB variant also available. Connectivity is more impressive compared to consumer handsets. No, you don’t get 802.11ac Wi-Fi or Bluetooth 4.2, but there’s push-to-talk, NFC, a 1D/2D laser scanner, worldwide radio frequency band coverage and support for all the major GPS technologies.